Claire Daly will tell you that her life changed on Sept. 23rd, 1971, when as a very (very) young girl, playing saxophone for 3 months, she heard a big band concert at the Westchester County Center. The saxophone section stood up for a soli, and Claire was on her chair screaming. After dragging her father to the stage door for autographs afterwards, she said of the Buddy Rich Band bus, “I’d do anything to be on that bus”. It was the kind of epiphany that only young enthusiasm can breed, but enthusiasm is still the motivating force in her musical life. After attending the Berklee College of Music, she began an education of another kind — making a living as a musician. Her career has included anchoring the sax section in the Diva Big Band for 7 yrs, freelancing in New York doing EVERY imaginable kind of gig (available on request! ), recording 5 CDs with the brilliant, quirky composer/pianist Joel Forrester and their band “People Like Us”, as well as two CDs as leader on Koch Jazz, (Swing Low and Movin’ On, soon to be re-issued on Ride Symbol Records) and a release of her own called Heaven Help Us All (Dalybread Records). She has performed on numerous CDs, film scores, jingles, and of course in many festivals and venues. In the fall of ’05, Claire began a new long term project, touring the country playing gigs and tracking down some of the hidden treasures of the jazz world, interviewing them on video, planning an eventual documentary. In October ’05, the William Jefferson Clinton Library in Little Rock, Ark. requested a copy of her first CD, Swing Low to be included in a listening station as a CD significant to the former president while in office. Six time winner of the Downbeat Critic’s Poll “Talent Deserving Wider Recognition” and winner of the Jazz Journalist Association “Baritone Sax of the Year ’05” category, Claire travels worldwide, performing as a bandleader and sideperson. She is working on a composition based on the life of her second cousin Mary (Toppy) Joyce. Joyce was the first non Alaskan to travel 1,000 miles from Fairbanks in 1936 by solo dogsled. Her story is a great American tale. Claire is currently planning a multi -media event in honor of Toppy’s life. “The CD title, Movin’ On, won’t be found among the 13 song titles, but the concept pervades the album. Some samples: “Softly as I Leave You,” “Every Time We Say Goodbye,” “After You’ve Gone,” “Goodbye.” Get the message? It’s Claire Daly’s way of dealing with a series of personal traumas, but if you’re expecting nearly 70 minutes of dirges played on that most appropriate instrument of sadness, the baritone sax, guess again. This is a gently swinging quartet session. 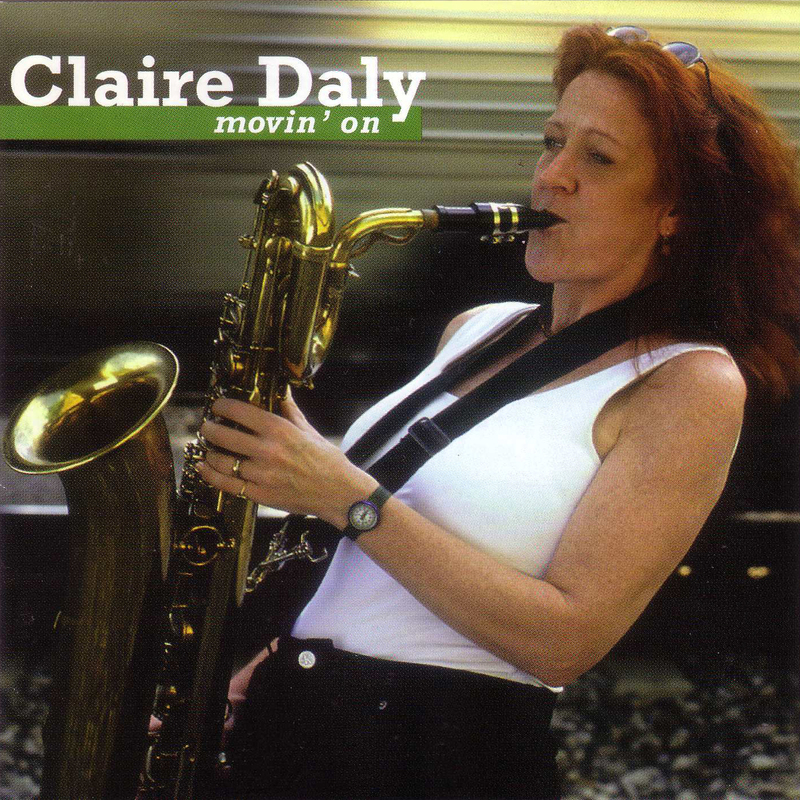 “Claire Daly is one of the first ladies of straight-ahead/classic jazz, and with the release of her CD collection, MOVIN’ ON, she fully establishes herself as the major female baritone saxophone performer in the United States, her remarkable sound clear and sweet and filled with harmonic devices. Claire Daly has a unique sound and MOVIN’ ON showcases that sound for the pleasure of listening audiences everywhere. Claire Daly ranks among the best of today’s contemporary baritone saxophone players.